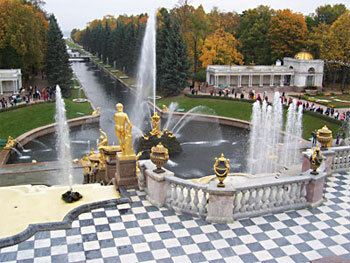 Peterhof is a former summer residence of the imperial family. It is located on the coast of the Gulf of Finland on the distance about 29 kilometres from the centre of St. Petersburg. 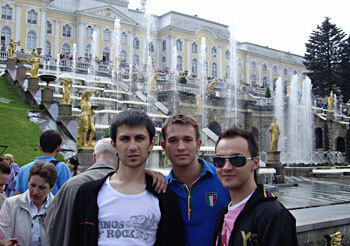 It is known throughout the world as a jewel of Russian art, a place of parks, palaces and fountains. In the past, it was an exquisite summer residence for Russian tsars. Peter the Great was the first to realise that he would need not only a new capital and a naval base on the Gulf of Finland, but also a new country palace. He commissioned a Versailles-by-the-sea from the French architect Leblon, who liked many of the tsar`s ideas and soon translated them into reality. Nowadays, the whole complex comprises the Grand Palace, the Lower and the Upper Parks with several park pavilions, 150 fountains and five monumental cascades. The Grand Palace was redesigned by Bartolomeo Rastrelli, the favourite architect of Peter`s daughter, Elizabeth, in the mid 18th century. Its fabulous Baroque decoration surpasses any expectations. The palace houses collections of Russian and European paintings, sculpture, furniture, porcelain and crystal ware. From the marble terrace of the Grand Palace, there is a magnificent view over the Grand Cascade, made up of waterfalls, 64 fountains and 37 statues. The system stars about 22 km from the Park in Ropsha which is 70m above the sea. Two system of canals bring the water to the ponds where it is collected at night. In the morning when the water gate is open, the water flows down through the system of dykes. The pumps are not needed for the work of fountains; they work under the water's own pressure (by grav-ity). The author is Tuvokov. Peter I sent him to study in France. The water is never used again. It flows out into the gulf. There are 150 fountains in the park, the work from 11 a.m. till 9 p.m. There are certain problems, if there is no rain the fountains either don't operate or operate only several hours a day. The lower Park covers area of 100 hectares. It includes 3 main cascades and 2 others along the slope of the hill (the Grand Cascade and 2 others are arranged symmetrically. Chessboard, golden hill is not finished. In the 18th century visi-tors arrived to Peterhof by boats and it was possible to come to the palace. First the French formal style was popular: straight avenues, abundance of fountains, lots of shrubbery and trees, trimmed in geometrical shape. The largest fountain is the Samson Fountain. Samson is a biblical hero whose strength was in his hair. (Delila cuthis hair when he fell asleep. The enemies blinded him and put him into prison. He could feel the walls and columns and he broke one of the columns. He and his enemies died.) Here you can see Samson rending the jaws of the lion apart. It is 3,5 meters high. The Nazis carted it away and it was made a new one. Terrace fountains to the east and west of the Grand Palace are marble cascades cut into the slope. Each cascade has a fountain. They were restored in 1848. From Monplaisir Palace. Steam Baths and Bathing pools made of wood, in 1800 were rebuilt by Quarenghi in stone. The Sheaf Fountains in the center of the garden which symbolize abundance and prosperity. It’s surrounded with four bells fountains decorated with gilded statue s represent Psy-che, Apollo, Faun and Rid, Bacehus and Satir. The territory from Monplasir Palace to the chessboard was occupied by Menagerie with exotic animals and birds. Not far from the west menagerie there is the Sun Fountain. It was built in 1721, and improved by Felten . It consists of 2 gilded disks, the pole rotates and disks rotate under the water. It create an impression of sunways. To the right is an Aviary. You can see a bronze statue of Peter I. It's the work of Russian sculptor Antokolskii, who sculp-tured it in Rome in 1872. Now it's a replica made from the original model. It's a life size - 2,14. There are several jesters fountains, the benchers, the oak-tree the umbrella. In the moment when a visitor would sit down, streams of water would spurt out from all sides. The Umbrella was built in the 18th century. The Oak fountain. You step on the stone and if you set on a lucky stone you can get drenched. To the left is the Pyramid fountain about10m tall, formed by 505 jets. To the right is a fir-tree fountain. Two Roman fountains built in 1799. They originally resembled the fountains that stand be-fore the Cathedral of St.Peter in Rome. The fountains were completely rebuilt. Chessboard Cascade is often called the Dragons cascade of 2 bronze dragons on top with streams of water pouring out the mouth. The cascade was remodeled in 70s of the 18th cen-tury and its steps were painted black and white. On both sides of the waterfall the marble statues of mythological heroes stand on pedestals. They were made by Italian sculptors. Dragon were restored. The conservatory - an oval garden with flowers, fruit-trees and a fountain in the middle. It's adjoined by the conservatory built in 1722-25 from a design by Braunstein and Zemtsov. In the center of the garden is a fountain - Triton forcing apart the jaws of sea master. A jet of water is spurting from the monster's jaws. The sculptural group was in lead from a model by Rastrelli. During the war it was destroyed. Bowl fountains. Adam and Eve Fountains on both sides of the canal. Made by Venetian sculptor Bonatti in 1718 jets spurt from the foot, they were buried in the ground and restored. Palace Square is the central Square of St Petersburg was the focal point of Russian revolutions 1905 and 1917 and is now the site of concerts (e.g. Elton John in 2007) and special national and civic celebrations. In the middle of the Square id the massive Alexander Column.